As apple (and pear) farmers, Debbie and Eric of Tiasquin Orchard have their favorites. Debbie prefers the Macoun for eating and baking, and Eric the McIntosh as just the best old time favorite. The farm started as a hobby when their children were small, and has grown to over 100 trees. During harvest season, you can stop by their stand and stock up for fall pie baking, or just plain eating. Each fall, fresh crisp Liberty, McIntosh and Macoun apples are picked and bagged daily and sold at a self-serve stand outside the Eric and Debbie Magnuson’s home off State Road in West Tisbury under the banner of Tiasquin Orchard. 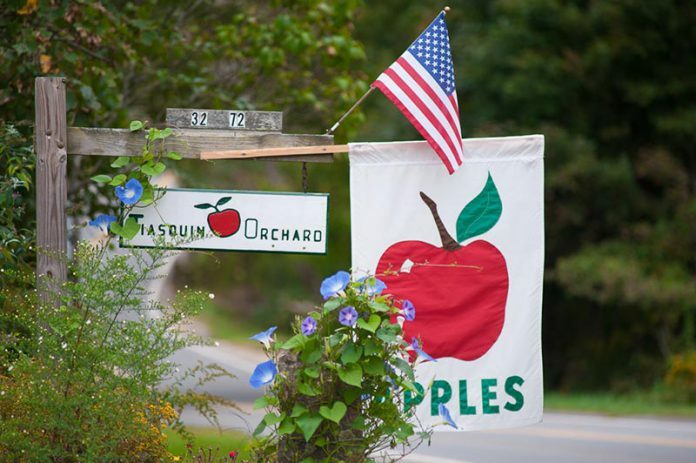 In banner apple years, Tiasquin Orchard apples are also sold at Alley’s General Store just down the road from the orchard, Morning Glory Farm in Edgartown, and Fiddlehead Farm in West Tisbury. Eric started the orchard as a hobby with 5 trees planted in 1973 not long after the couple married. Now, with approximately 100 apple trees, it’s become the largest apple orchard on the island, with some pear trees as well. Harvest starts in late August with the early apple varieties.